Again it was Alberto Gilardino with a fantastic header who decided the match, this time a cross of Biondini leaded to the only goal in Luigi Ferraris. For the first time this season Fetfatzidis started in the line-up and within a minute he was fouled in the penaltyarea and Genoa got a penalty. Unfortunately Gilardino missed it, so we had to wait for the openinggoal. In the 21st minute our new “star” Vrsaljko had to be substituted by Centurion because of an injury. After the penalty Parma got the best chances in the first half, but Mattia Perin again was in a good shape, halftime: 0-0. In the 22nd minute Gilardino scored the goal and of course Parma tried more and more to score the equalizer. Parma got only 1 big chance in the second half while Genoa could decide the match several times in the break-out but as usual we had to suffer till the end. Genoa now has 11 points in 10 matches and is 5 points ahead of the relegationzone. Last week against Chievo Alberto Gilardino was our best player with 2 goals. In Juventus Stadium our best player surely was goalkeeper Mattia Perin. Our 20 years young goalkeeper saved us many times and kept the score at halftime at only 2-0. Juventus deserved the advantage, that is clear but they needed their yearly false penalty to open the score. Carlos Tevez was fouled outside the penaltyarea by Biondini, but the referee whistled for a penalty that was realized by Vidal. The second goal of Tevez was a real goal, so the score at halftime was 2-0. In the first 15 minutes of the 2nd half Juventus tried to score again a few times, but also after the break Mattia Perin was almost unbeatable. In the last minute also we had our only chance, but Fetfatzidis headed it over the goal of Buffon. Next Wednesday we play in Marassi against Parma that beat Milan today by 3-2. Let’s hope the “cheeseboys” are still drunk Wednesday at 20.45 hours. Mr. Gasperini returned in Luigi Ferraris with a victory: 2-1 against Chievo. Giovanni Marchese his punishment was over at 15th October, so he started as left midfieldplayer in the line-up. After 22 minutes Giovanni gave a perfect cross on the head of Alberto Gilardino who headed it in the seven of the goal: 1-0. 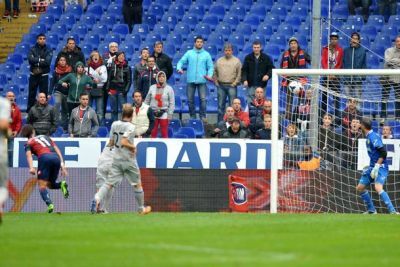 At the beginning of the second half Chievo scored the equalizer out of a corner of Genoa. 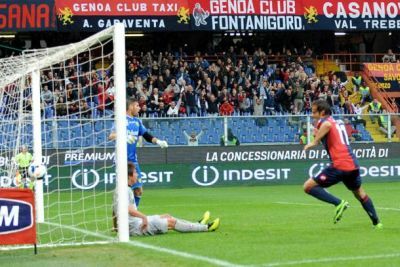 Almost the complete defense of Genoa was still on their way back to their own goal when Simone Bentivoglio scored 1-1. The happines of Chievo lasted only 2 minutes when again Alberto Gilardino scored: 2-1. 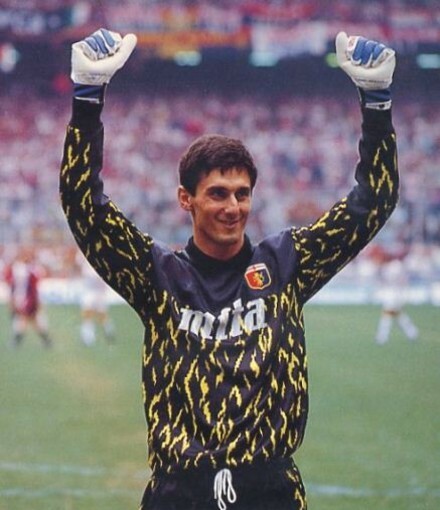 After this goal Genoa had several chances to decide the match definitively but we all had to wait the full 95 minutes to celebrate the first victory of Gasperson. Genoa now has 8 points in 8 matches and plays in Juventus stadium next week. The last 2 years the Dutch boys of Gelateria le Stelle lost the final against Allunamanin, but this year the iceboys took their revanche. 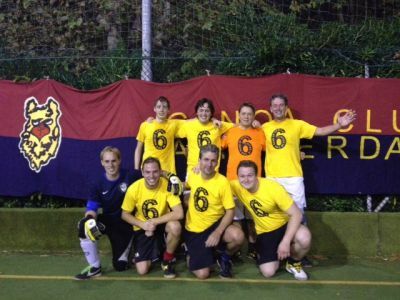 The team of coach and owner of the gelateria in Naarden (Holland) Fred de Bruijn first beat their friends of Genoa Club Verdeal in the semifinals by penalties. 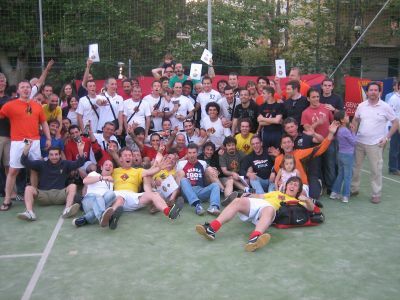 In the final they beat I Lama dei Distinti after extra time: 3-2. The Dutch boys received the big trophy out of the hands of great organizer Luca Carini at night in Restaurant Maniman in Castelletto, where also very friendly Simone Braglia, browned Leo Berogno and the organisation of Un Cuore Grande Cosi enjoyed a fantastic dinner by Andrea and his staff. Next Saturday 19th October the 6th edition of United in the name of Genoa takes place in Albaro. 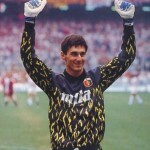 Three Dutch and 5 Italian teams try to win the trophy which goalkeeper Simone Braglia will handover to the best team. This yearly tournament is the symbol of the friendship between the Italian and Dutch fans since 1991-1992 in the Coppa Uefa. The day after the tournament we all visit the return of Gasperson in Marassi: Genoa-Chievo. 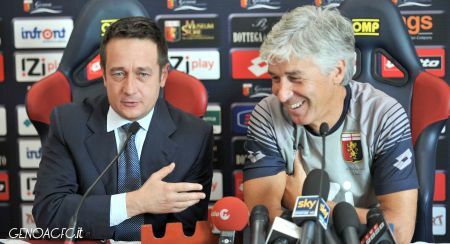 After the defeats against Udinese and Napoli which meant the end of Fabio Liverani, our “new” coach Gasperini had to start his second adventure with our Rossoblu-club in Catania. In our first year in Serie A (2007-2008) we draw 0-0 in the city of the Etna, but this draw was followed by 5 defeats in the following years (1-0, 1-0, 2-1, 4-0 and 3-2), so a hard start for Gasperson. Our very friendly coach didn’t chance a lot in the line-up, only the position of Mario Sampirisi on the left side of the midfield (usually he is a right-defender) was a surprise. In the first half Genoa was the best team in the field and several times close to the openinggoal. 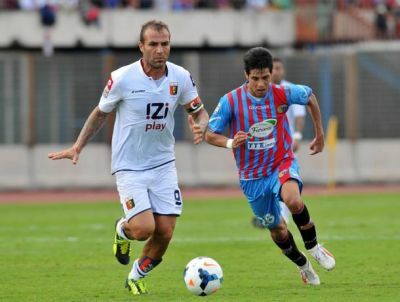 After halftime Catania was stronger and they opened the score by Barrientos in the 59th minute. Gasperson immediately brought Fetfatzidis, Stoian and Calaio in the team and these offensive changes succeeded. Stoian send a perfect cross towards Gilardino, but just before Alberto could head it into the goal it was Legrottaglie who did it: 1-1. A honest draw and a good start for Gasperson who now has 2 weeks till Genoa-Chievo to reconstruct the team. 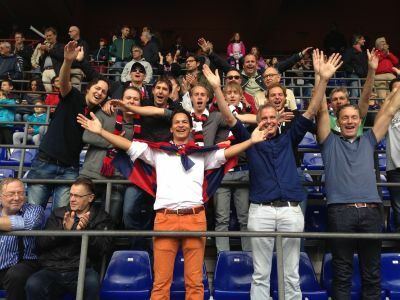 Genoa-fans finally happy: Gasperson is back! 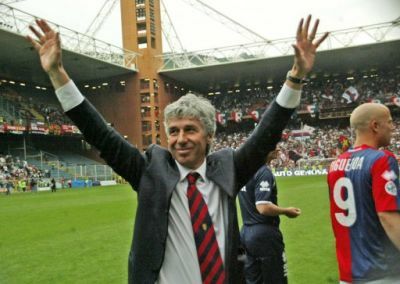 Our most successful coach since Mr. Bagnoli at the beginning of the nineties Gian Piero Gasperini is back with Genoa! Gasperini was our coach since the start of the season 2006-2007 in which we promoted after 14 years to Serie A. At the end of the season 2008-2009 he brought us in the Europa League. In November 2010 after the defeat in Palermo (1-0) Gasperson was fired by Mr. Preziosi and substituted by Davide Ballardini. Now almost 3 years later the friendly coach is back with Genoa! Within 25 minutes Goran Pandev scored twice in Marassi and the game was over. In the rest of the 65 minutes Genoa never came back in the match and only because Napoli has to play Tuesday in the Champions League the score stayed 0-2. 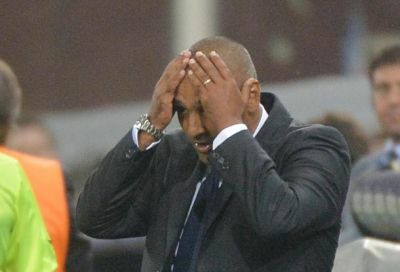 After the match coach Liverani was fired by Mr. Preziosi. After Malesani last year at the end of the match against Napoli (6-1 defeat) now after only 6 matches Fabio Liverani is fired after a lost match against “our friends” (0-2 defeat).